We had a terrible incident where we discover that Rosh was shot to death. Rosh was born in September 2004 at Uniab river and then move to Hoanib river where he spent time with the lioness of the flood plain and Okongue pride.Mostly Rosh covered the area around Gommatom river, Hoaruseb river, Oruhito, Giribes plains, Kanamub and Okongue area. During his time in Puros area Rosh has killed in total about 6 cattles in the area. We as Puros conservancy lion Rangers are unhappy about the death of Rosh, we heard that Rosh killed one cow and a horse between Puros and Tomakas that resulted to his death. The farmer found the lion eating the cow on the main road from Tomakas to Puros. Then he proceeded further north. We had an effort to go monitor the lion before his death but we didn’t have any transport available to go rescue the lion. Unfortunately there was no car available. After few hours we heard that Rosh was shot to death by the farmers. More than half of the Puros community and members of the conservancy are feeling unhappy because of killing that lion. But the elders only think about cattle to survive, they don’t see things like the young generation. We keep the lion and collar safe locked in conservancy office. MET came from Opuwo to take the skull and the collar. The challenge that we are facing at the moment is lack of support in conservation, like uniforms for recognition and especially when it comes to lions monitoring as we don’t have transport to monitor their movement. TOSCO is funding the salary of one lion ranger. As they do not have their own vehicle, the lion rangers were not able to reach the danger zone in time to possibly save Rosh. Proper resources, like tents and bedrolls and ultimately a vehicle, for the lion ranger programme are therefore a top priority for the future. Lions and people have always been incompatible. But there used to be a balance of power. Lions threatened people and their livestock, people killed lions when they could, but most of the time both kept a respectful distance from each other. With guns and poisons becoming available, the scale of power has tipped heavily in favour of people. This was the beginning of the massive decline in lion numbers so that there are now only about 20.000 left in Africa. But it is not all despair for the lions in Namibia. There is a silver lining on the horizon, and that is tourism. Rosh was shot on 01 July 2014 by a communal farmer in the Puros conservancy (see http://www.desertlion.info/news.html). Our instinctive reaction to this is to cry foul and blame the locals for not caring for the lions and for being trigger happy. Once we start to properly think about it, however, we realize that there are no lions in and around Windhoek, or any other city. And there are no lions on commercial farmland. They were simply killed there many years ago. So, the lions actually have a refuge in parts of Namibia’s communal land, the conservancies. 20 years ago, after the big drought of the 1980ies, also in Namibia’s north-est almost no lions were left. But now there are again about 150-200 in the Kunene region! Something must go right for the lions there. “More than half of the Puros community and members of the conservancy are feeling unhappy because of killing that lion [Rosh]. But the elders only think about cattle to survive, they don’t see things like the young generation.” This is what the Puros lion rangers wrote in the report on Rosh’s death. That is very good news. Rosh is the first lion to be killed in the Puros Conservancy in 3 years! But during these 3 years, many cows, donkeys and horses have been killed by lions in Puros. During the lions’ absence the local people have forgotten how to minimize losses to lions. Donkeys and cattle run free, often without herders and are not kraaled at night. 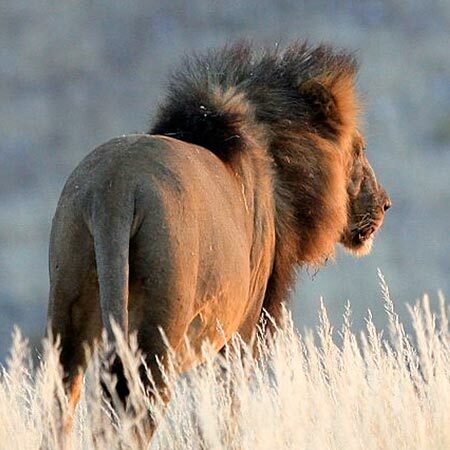 And a lion that has once realized how easy it is to catch a cow would not waste energy on zebra or oryx. Thus people loose livestock. Better herding practices are needed. But the message is: the local people choose not to shoot far more often than they do choose to shoot! But only the negative cases make headlines. Is this because the local people do not solely depend on their livestock anymore for survival but have another source of income, which is tourism? It is not the only reason, but it certainly contributes a lot. The young people have grown up with tourism, they are aspiring to be guides, rangers or chefs. But not everybody benefits from tourism in the same way. In terms of money Rosh was for sure worth a lot alive, because tourists who came to the lodges in the area could observe him. But to the farmer who shot him, he was only a costly nuisance. It is part of the tragedy, that revenues from tourism do not trickle down equally to those who bear the costs. One individual can ruin the efforts of many by a single shot. Responsible tourism aims at changing the distribution of benefits from tourism in favour of the local people. We, as tourism businesses and travellers enjoy using pristine landscapes like the Huab, Hoanib and Hoarusib, rich with game, and of course, seeing the desert lions. These assets are managed and protected by conservancies, i.e. the local people. What payment do they get from us for this service? Some local people get employment in lodges, some sell crafts and there is some revenue from joint venture tourism businesses. But most conservancies derive most of their income from hunting, not from tourism. And most do not have sufficient income to cover their costs. Conservation costs money, unfortunately. Also the lion ranger programme lacks funding. But many tourists do not leave a single dollar in these areas because they camp in the river beds and bring all their provisions. TOSCO supports a number of programmes, connecting tourism in Namibia to conservation and local communities for the benefit of all. TOSCO has now proposed a voluntary traverse fee on communal land in order to fairly remunerate local people for the service they are rendering to tourism by providing their natural assets intact and pristine. More on this in the next post. Just at this moment, the famous Terrace Male is roaming around Puros, looking for prey. Let’s support the people who have made sure that he is still alive! How very sad. What a pity the rangers do not have the necessary equipment / tools in order to properly do their job, in which case this may have been prevented. 😦 Someone / a company needs to step up and sponsor them the items needed. Yes Dee you are right and this is currently being done… more info to come soon! Thanks for your concern. Hi many thanks go’s to Tosco team and other members that have offer themselves to support this very important program, and I thing we might loos the terece male due to it movement because it move around puros ,and again the Lion ranger they don’t have any kind of necessary equipment for monitoring . Thank you Lion Kasupi for your concern. We are working on more equipment for the lion rangers (tents, bedrools, uniforms, bagpacks etc…), but the most difficult issue is a transport. How is the Puros conservancy vehicle? Everyday Terrace is alive is a success and you are the only ones who make it happen, Thank you and keep up your concern and good tracking work.